It has come time for me to close down my in home preschool. I know — it’s kind of a shock. I’ve poured my heart and soul into my program for the past four years. This decision was super hard, and I spent several months going back and forth over what I should do. In the end, I knew it was the right decision for our family. We welcomed a third baby into our home this spring, and I’ve decided not to try to be superwoman and balance a preschool at the same time. I’m on an extended maternity leave, if you will. The truth is that after having two babies, I know how special that time is to have a teeny tiny one. It flies by too! Those babies don’t stay babies for long, and I want to just savor this time. I want to take photos of her as often as possible. I want to just snuggle during the middle of the day while the older two are playing. I want to fall asleep feeding her. I want to just stare at her as long as I can. I want to love my baby the best way I know how. This is also a time that I want to connect more with my big kids, Sugar and Spice (6 years old) and Lil’ Red (4 years old). There’s no doubt that I had to spread out my attention and time with them while I did preschool. They had wonderful friends to play with while I was busy helping those who needed my attention, but now I look forward to connecting with them even more. So now that I’ve shared the big news, I’ll answer some questions that I have been getting a lot. 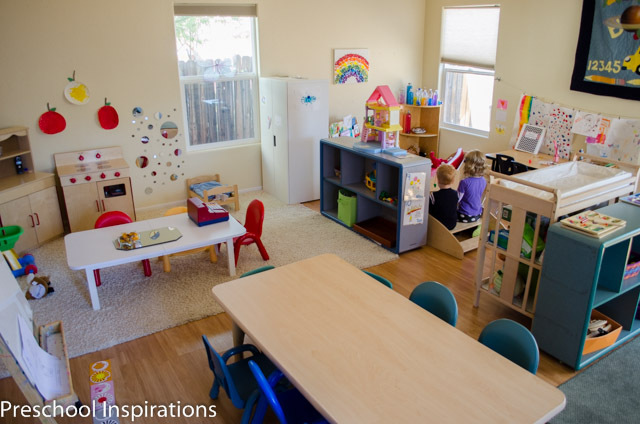 What will happen with Preschool Inspirations? Since I decided to close the preschool about six months ago, I’ve been blogging with just my kiddos and not my class. So in other words, I’ve already made the major change. Connecting with you all is the highlight of my day, and I will continue to share our favorite activities. There are so many posts that I’ve wanted to do, not about kid’s activities, but about the growth and development of a child that I just wasn’t able to make time to do with the preschool. Those are on the front line now too, and I am super excited to write about them. There is even a book on the agenda. If you know me, I am passionate about potty training and helping parents and teachers support kiddos as well as possible in this. Our family also had some huge struggles at one point, so I like to help others by sharing our own story. I’ve had my outline sitting around for a year now, and it’s time to get it written. How did my clients respond? I am blessed to have amazing clients! They were all supportive! I tried to prepare myself that some may leave the program because I was closing in April. No one left though. In fact, I had some ask to bring their kiddos more so that they could get as much preschool in as possible before it ended. My heart was overflowing by these requests. Some of my clients are dear friends to me now. I’ve seen nearly every preschooler on a play date since I’ve closed, and I plan on keeping in touch with all of them. The relationship I have with my families hasn’t ended — it’s just changed. What are my colleagues saying? Well, my in home child care and preschool friends were mostly stunned that I would put a stop to my services. After-all, I had a huge waiting list and only had preschool four days a week. Some of my friends tried to make it sound like I was irreplaceable. While I appreciated the compliment, I reminded my colleagues that there are lots of preschools in my area, and there are even more great teachers around who will give these kiddos the TLC they need. And of course I’ve been sending my clients to my incredible friends who offer similar services. Now I have more time to spend helping others who own preschools and child care programs. I am looking forward to doing workshops this year and making resources to help the amazing and nurturing business owners with the business tools and resources that are not widely available to make their programs run smoother. There are even plans to make a huge packet with all of my own contracts, enrollment forms, policies, and other “boring” but essential paperwork to offer to the public. For now I’m just going to enjoy doing homeschool preschool and 1st grade. I will have to take it year by year. I am confident I will teach again in a classroom setting. It may not be in my home though. I forgot what it was like to see my home as a haven instead of my workplace. It is honestly nice not to have to keep my home up to spec for an unannounced and looming licensing inspection. I feel like I can just relax in my home now. That’s so funny to say even! We can get cool things now like a tire swing without spending thousands on pea gravel. And I don’t have to lock everything up. Or document every boo boo. We can just be and just do. First and foremost, I plan to rest and recharge! Pregnancy was not easy on me (it never is! ), and I just want to take things easy. I am going to work on being a better mom, wife, and homeschooling teacher. I must admit that I need to work on being a better friend too. I had to spread myself thin when it came to spending time with those I love, and I want to reconnect now. It’s good for all of us. It’s my goal to renew myself spiritually. I only get one shot at life, and I want to make the most of it. I want to connect with you all. If you have questions about how to run a preschool, how to work through delicate situations, how to teach a child to write her name, I would love to hear them! They will help give me ideas of what to write about. If you are a parent and want to know what is “normal” or what is a red flag, I would be thrilled to help you, or help find resources for you. The best way to connect with me is on facebook. I love writing and sharing with you all on Preschool Inspirations, but it is a labor of love. There are number of fees involved to keep things running smoothly. I have to keep the hackers out, protect my images and content, help keep my site available to you whenever you come visit, and I definitely want to keep things pretty and welcoming around here. The best way to help out is to share any of the articles or ideas with your friends. Use any form of social media: facebook, pinterest, twitter, or whatever you love! You can follow me on my two favorite social media arena’s, my pinterest account or on facebook. So many of you have helped by using my affiliate links! Those help cover costs of operating the site, plus I hope you are getting wonderful products that you need or love. Here are some of my favorite products for teaching the alphabet and these are my must-have supplies for each year. And I am so grateful to our sponsor, Daily Child Care Report , for helping keep the website around and providing a much needed service. If you know of or own a company that offers services that would be helpful to my audience of primarily parents and teachers, please send them my way! So there you have it!! It was a little scary to share this big change with you all because it is a big step for us all. I love being real with you though, and I always appreciate your encouragement and kind words! All the best! I know how hard that decision is to make. I’ve returned to Family Day Care in 2 countries and 3 states here in Australia. I’ve directed other services which I loved but FDC is my best fit. You may come back at a better time for you and your family. In the meantime, enjoy that unlocked/no reporting feeling!! I just wanted to say thank you, I am a Head Start teacher and I enjoyed reading your posts. You have really been a blessing and helpful. Glad to see you are taking time with your family. Good luck and God Bless!